Panic! At The Disco are a band with few saving graces. If you were to roll them through an algorithm of critical analysis they would suffer severe injury. Unlike that number crunching brute, I’m ashamed to say I’m a more forgiving creature. While acceptably comprehensible English isn’t their strongpoint they do have a knack for writing songs that burrow with a near parasitic resilience in your mind. Their first two albums: A Fever You Can't Sweat Out and the improved Pretty. Odd. managed to provide these by the bucket-load, a kind of fast food for guitar rock; in that respect Panic! still retain some definite worth. 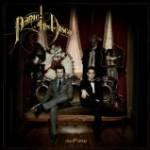 Vices & Virtues bucks that somewhat healthy trend in entirely the wrong manner, and represents exactly the kind of the uninspired drudgery of Americana indie rock that has emerged in the wake of the likes of My Chemical Romance and Fall Out Boy. It’s a style that is so self-constricting in its atmosphere and influences, and while the formerly mentioned bands have made it their own, the endless ‘me-too’s are just about sapping any last remaining creative font dry. Now, it is easy to be cruel about a band like Panic! but this record is a soul-destroyingly easy listen; by that I mean it fails to offend your ear on any level whilst maintaining the miraculous feat of not holding your curiosity for almost single minute of its running time. I guess then it will come as no surprise to hear that they have lost their foremost song-writer and guitarist, Ryan Ross, and his absence and the absence of any serious tunes on this album may well prove too prospectively terminal a correlation for the band to endure. Perhaps a little subjective evidence is in order: The Ballad Of Mona Lisa is the first single, and after listening to it seven times on near repeat, I still cannot stir my memory into conjuring up its chorus. I doubt it’s a bad song, it’s just so criminally lacking in identity. Of the traditional form tracks, Hurricane does the best job. As it closes with the accusation “you’ll dance to anything”, you can’t help but hope it’s some witty self-deprecating backslap at their own fans, but again that is probably asking too much. The record as a whole makes for such concerningly disposable music it provides a dispiriting indictment of what passes for pop material these days. I really can sum this album up that quickly I’m afraid. The final two songs perhaps mark some hope for the band: Nearly Witches [Ever Since We Met…] and the finely weighted Sarah Smiles in particular resurrect the sense that this band are capable of a flair too often unseen in the American alt-rock genre. These isolated examples certainly don’t provide much of a reprieve it must be reminded, so let’s hope they don’t need another.